Backed by the spectacular Santa Lucia Mountains, the Carmel Valley Ranch sprawls over almost 500 acres of rolling hills, just inland from Carmel Bay. 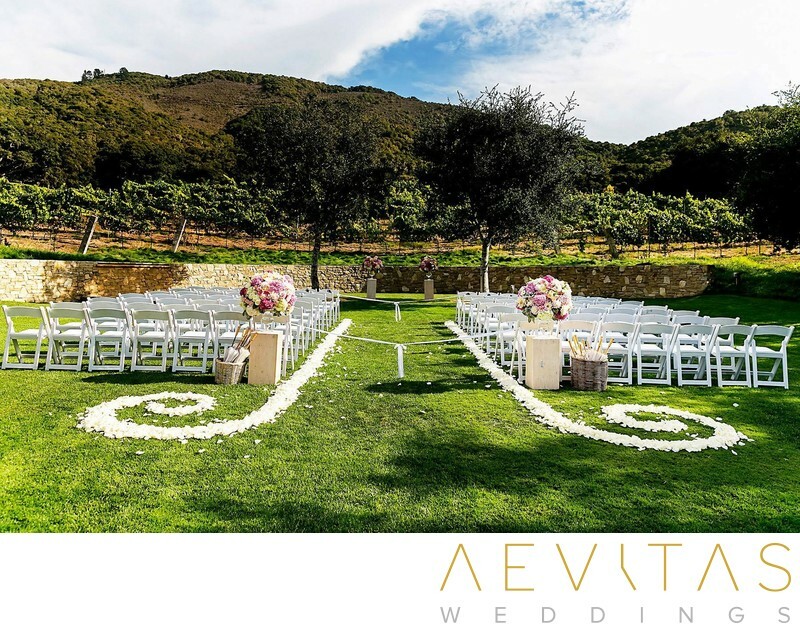 With vineyards, lavender fields and never-ending meadows, it is a deservedly popular wedding venue for couples after a whimsical, nature-inspired event. You can select from their stunning Vineyard Lawn or Valley Lawn for you wedding ceremony, or opt for their River Lawn with its rustic 19th century farm house. With sweeping views and bathed in rich late afternoon light, each can be decorated to the couple’s own tastes, with white folding chairs and a complimentary honey-lavender lemonade station included in wedding day packages. While your guests enjoy cocktail hour, you and your loved one can wander the vineyards and lavender fields for a whimsical couple portrait session. In addition to stunning natural views, there is a rustic wooden bridge and romantic tyre swings to incorporate into your wedding day images. There are numerous reception spaces to choose from, so whether you dream of wining and dining under the stars or within an opulent ballroom, your dreams can come true at the Carmel Valley Ranch. The Redwood Room is perched above the Vineyard Lawn in the main lodge and comes with a private outdoor terrace, or you can opt for the more intimate Oak Room with its own courtyard. The Clubhouse overlooks the stone-lined Valley Lawn, and after a recent makeover is perhaps the Carmel Valley Ranch’s most impressive reception venue. It boasts high vaulted ceilings and stunning valley views, best witnessed from its exclusive terrace. If you prefer a romantic alfresco dinner, you can opt for a tented reception on Carmel Valley Ranch’s driving range or have an intimate celebration within the Organic Garden. Here you can sit in the midst of the produce that the Carmel Valley Ranch grows for its famed farm-to-table cuisine. No matter which venue you choose, you will be treated to the Carmel Valley Ranch’s gourmet menus and exemplary service. There is even an Adventure Kitchen where you can watch the chefs work first-hand! The Carmel Valley Ranch is also one of few venues that allow for a grand sparkler exit, with your loved ones lining the walkway as you and your new partner for life head off into the night at the end of the evening. After the festivities there’s no need to rush away, but relax for the weekend in one of the Carmel Valley Ranch’s beautifully-appointed suites. Cosy fireplaces, private balconies and stunning views create an undeniably romantic ambiance, while the on-site Spa Aiyana awaits all your pampering needs.